Joeeum Bae, junior, once placed 41st out 95 during a tournament. Now, she aims to beat that ranking. Women’s golf takes it to the greens for their season opener on Sept. 8. Opening day for the ladies is in Johns Creek, Georgia at the Atlanta Athletic Club. Head coach Cathy Mant, who is known as the winningest coach in Georgia State golf history, enters her 16th season. Mant had the privilege to be the coach for the United States Girls this summer in the Toyota World Junior Golf Championship in Japan from June 16-19. Last year, the team had a roster of mostly freshmen and sophomore. The injury bug bit the Panthers which hindered their performance a little. The team struggled majority of the season in 2014, now the young team has more experience under their belts and are looking forward to the future. Let’s look at some of the athletes on the golf team. Bae is a junior who played her best round of 74 at the Lady Pirate Intercollegiate. There, she placed 41st out of 95 golfers. 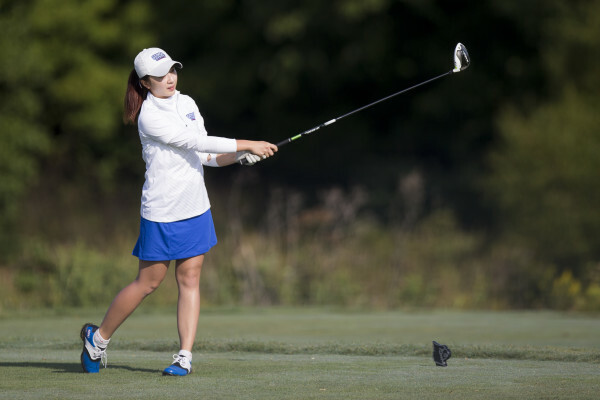 The Korean native made the Athletic Director’s Honor Roll in 2015 and 2014. Gregson is a freshman who’s a native of Bristol, England and played at Millfield Senior School. In 2014, she won the Gloucestshire Ladies Championship with 79-73 rounds. When she was 11 years-old she became the youngest female to win English Golf Union National Club Championship. Entering her junior year, the French native played in all nine events last season. Le Coz finished in the top 25 three times last season. In the Sun Belt Conference she was tied for 25th. She has made either the Dean’s or President’s Lists every year of her enrollment. The only senior on the team, topped her career best last year in the Lady Paladin Invitational with a score of 226. Made the Athletics Director’s Honor Roll in 2015 President’s List in 2014. Last year had a strong start in the four events she played in with an average of 76.67, but season ended due to surgery. The native of England scored 75 or lower on six rounds of golf out of 12 rounds in the fall. Played in all five spring events and had an average score of 79.62. Sari place 21st in the Sun Belt Conference Tournament and 18th in the Amelia Island. The Germany native made the 2015 Dean’s List for spring. Carded a pair of best-round 77 scores in the Florida State Matchup and the Amelia Island Intercollegiate. Zabarte’s tournament score was 239 at Florida State. The Spain native was on the 2015 Spring Athletic Director’s Honor Roll. Freshmen Gloria Zeitler became the eighth international player on the roster this season. The Germany native played in the Am Reichswald golf club in the Nuremberg area. Zeitler plans to major in pre-medicine.